I tend to avoid films once they’ve received too much media attention and praise. Maybe I want to be the rebel and avoid the crowd, but mostly, I just can’t stand to be let down after the build-up. 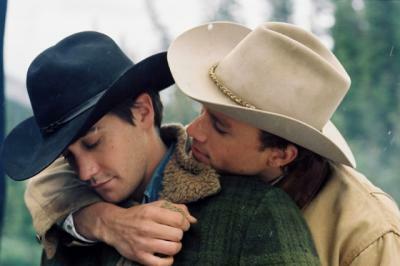 Not so with “Brokeback Mountain.” Not much to say because I’ve just returned home and am feeling slightly sad, sensitive, and speechless. But whatever political debate you decide to discuss after the credits roll, I will warn you: overall, this film will break your heart a little. After the debates (not to detract from Ang Lee’s deft handling of the larger social limitations), one is left with a sad love story to grapple with. I arrived home and weeped a little. Verging on a lot. And now I’m listening to Beck’s rendition of Daniel Johnston’s “True Love” to carry on with the current sentiment (it’s a lovely version, incidentally). How much more fitting is Barry Schwabsky’s poem below on top of the movie, the song, and the oncoming Noreaster that plans to bury New York City; I don’t know. But it’s a good one from his new chapbook, For Despair (Seeing Eye Books), so I’ll leave you to it. Here’s to a mellow & sleepy bittersweet Friday night, folks. your zigzag songs back and then ahead.